It was a busy weekend of fast-paced hockey action at the New Waterford & District Community Centre. 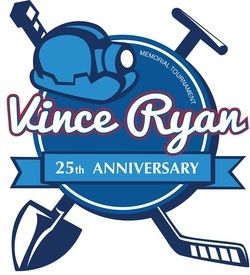 The 25th annual Vince Ryan Memorial Scholarship Hockey Tournament, one of the world's largest adult hockey tournaments, took place in 10 different rinks across Cape Breton, including the New Waterford venue. The New Waterford & District Community Centre saw a total of 21 games during the four-day tournament, which ran from Thursday, March 20th to Sunday, March 23rd.
" We were glad to host another successful event," said Robert MacKenzie, NWDCC Board of Director. " We were able to offer full canteen service for players and many spectators." Score results from action at the New Waterford & District Community Centre saw. Thursday, Sobey’s Chiefs 5, New Waterford Friday Knights 2; Lingan ERT 6, Marion Bridge Fire Department 3; Friday, Cape Scott No Stars 4, Kennedy Animal Hospital 3; Gander Spitfires 12, Hockey Moms 1; Cape Breton Highlanders 4, CBRM Police 2; Devco Islanders 2, Mortgage Masters 1; Antigonish Horn Dogs 5, Barn Crashers 4; Colchester Flames 10, New Waterford Friday Knights 4; Saturday, Mortgage Masters 5, Deer Lake Labatts 2; Sunday Centennials 3, Antigonish Horn Dogs 2; CBRM Police 3, HMCS Fredericton 2; The Jets 7, Pictou County Choppers 1; Halifax Fire Department 11, Lingan ERT 2; Deer Lake Labatts 7, Kennedy Animal Hospital 5; Sobey’s Chiefs 5, Colchester Flames 4; Ice Dogs 7, Pasadena Pylons 2; Halifax Fire Department 6, Glace Bay Fire Department 2; New Waterford Friday Knights 10, Isle Madame Hornets 6; Sunday, Sobey’s Chiefs 6, Colchester Flames 5; Sackville Subway 5, Strong Chiropractic Islanders 2; Sydney Mines Thunder 6, Forest St Lumberjacks 0. The New Waterford & District Community Centre will be the venue for 21 games at this year's 25th Annual Molson Canadian Coors Light Vince Ryan Memorial Scholarship Hockey Tournament. The four-day tournament, which started last night, Thursday, is one of the world's largest adult hockey tournaments. Score results from Thursday's action were not available at press time. A total of 130 teams are registered for this year's tournament, including three teams from the New Waterford area, the Bud Light Habs, Lingan ERT and the New Waterford Friday Knights. Action resumes at the New Waterford & District Community Centre today, Friday, at 2:30 p.m. with the Cape Scott No Stars versus Kennedy Animal Hospital, followed by Gander Spitfires versus Hockey Moms at 3:45 p.m., CBRM Police versus Cape Breton Highlanders at 5:00 p.m., Devco Islanders versus Mortgage Masters at 6:15 p.m., Antigonish Horn Dogs versus Barn Crashers at 7:30 p.m., and Colchester Flames versus New Waterford Friday Knights at 8:45 p.m.
Saturday's action gets underway at 8:30 a.m. with Deer Lake Labatts versus Mortgage Masters, followed by the Antigonish Horn Dogs versus Sunday Centennials at 9:45 a.m., CBRM Police versus HMCS Fredericton at 11:00 a.m., The Jets versus Pictou County Choppers at 12:15 p.m., Lingan ERT versus Halifax Fire Department at 1:30 p.m., Deer Lake Labatts versus Kennedy Animal Hospital at 2:45 p.m., Sobey’s Chiefs versus Colchester Flames at 4:00 p.m., Pasadena Pylons versus Ice Dogs at 5:15 p.m., Halifax Fire Department versus Glace Bay Fire Department at 6:30 p.m., and New Waterford Friday Knights versus Isle Madame Hornets at 7:45 p.m. The championship games for Division "L", Division "K", and Division "O" are scheduled for Sunday at 10:00 a.m., 11:20 a.m. and 12:30 p.m., respectively.